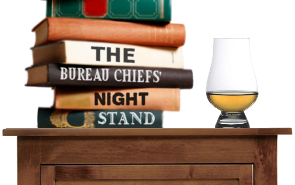 After a long day at work, the Bureau Chiefs like to relax in bed with books and comic books. Since there are 16 of us, our bed is 64 feet wide and our nightstand is the size of a small elephant. Here’s what is stacked up next to it. It’s been a light week for me. I picked up the latest volume of Yukiya Sakuragi’s Inubaka , a manga series about a cute girl who moves to Tokyo to work in a pet store. It’s just shy of being an out and out fan service series, but I read it mostly for the cute doggie illustrations and fish-out-of-water workplace comedy routines. I also picked up the latest issue of Fortean Times , which has a cover story about Robin Hood and a possible connection between the myth and the Templars. I’m a soft touch for Robin Hood stuff. It’s been a slow week for books, though. All I’ve managed to do is get through Feet of Clay , the next book in the “Guards” series by Terry Pratchett. I’ve just not had time for any reading other than right before bed lately, and I still haven’t felt like starting anything other than light comedy. You may remember from last week that I was complaining about the fact that I had more books than I knew what to do with. Well, I know what I have to do with them, I have to read them, but between my many writing assignments and my interpretive dance classes, I just never seem to find the time. However, a recent birthday found me with a bookstore gift card and, well, I just can’t say no to a deal, baby, and I picked myself up a copy of MAD’s Greatest Artists: The Completely MAD Don Martin . It’s a massive two-volume slipcased set containing every bit of cartooning Mr. Martin contributed to Mad over his 32-year run with the magazine, and it’s a beautiful thing. Sadly, as you’ll see at that there Amazon link (and elsewhere) it’s being massively discounted, and you can easily find this set, originally priced at $150, for well under $30. Well, okay, it’s good for me in that I can get some swell books for dirt cheap, but in the long run the near-immediate close-out of this set certainly doesn’t seem like it would encourage a Complete Sergio Aragones or a Complete Al Jaffee, would it? At least, not in this format. J. Michael Straczynski’s run on DC Comics’ team-up book The Brave and The Bold (accompanied by artist Jesus Saiz) has been mostly dopey so far, with interesting pairings but hilarious heavy-handed moralizing and spectacularly out-of-character portrayals of some of DC’s big guns. But over the last couple of issues, things have improved…an Atom/Joker team-up last issue was effectively creepy and unsettling (and, for continuity nerds, provides a possible “out” for the Atom’s behavior in the recent Cry for Justice mini-series), and the new issue, #32, featuring Aquaman and the Demon versus Lovecraftian critters, was surprisingly…well, I hate to use the word “creepy” again, but there you go. And “creepy” as in “monster/ghost/haunted house” creepy, not the usual superhero comic “hypersexualized women” and “guys in tights punching each other” creepy. 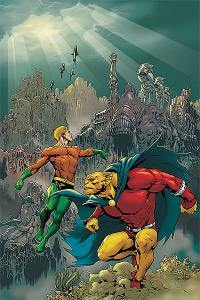 Plus, it was nice to see Aquaman treated with a little awe and respect for once, considering the bad rap he usually gets. I’ve finished The Road (short version: affecting but not very) and have switched over to non-fiction. 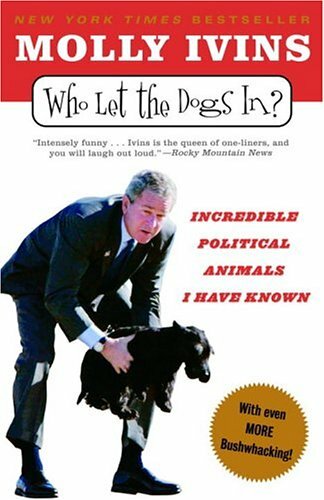 Being a Texan and a liberal, I figured it was about time I (finally) dig into Molly Ivins, so I picked up Who Let the Dogs In: Political Animals I Have Known. This is basically a collection of some of her best work, so yes, it’s a Greatest Hits compilation, which is something I tend not to believe in. (Great songs are made that way by their context, and anyway the work that strikes closest to home tends to be off the beaten path.) But hey, it’s what the bookstore had in stock when the urge struck me. I’m still just a few chapters in, but already I’m just sore as hell that Ivins isn’t around to see this whole tea-bagger thing. I knew I was in good hands when, in the introduction, Ivins hopes there’s a special circle in Hell for people who distort and corrupt the English language for political gain. That’s my top pet peeve of the past 15 years–that so many words have been so loaded with poison that they are now completely unusable. I also value her belief that we must never stop laughing. What better defense mechanism against horror and absurdity is there? Her aw-shucks style would be bothersome were she not so sharp and so funny, and I predict I’ll eat through this book pretty swiftly. I started reading the first couple volumes of Koji Kumeta’s black comedy Sayonara, Zetsubou-Sensei: The Power of Negative Thinking . I remember when this series was announced some people were commenting that it was going to be almost impossible to translate because it contained so many cultural references even a Japanese person may not be able to catch them all. While more knowledge of Japanese culture might help when reading the book there are still plenty of funny situations that don’t require cultural footnotes. The reader is introduced to Nozomu Itoshiki as he attempts to hang himself from a cherry tree. The Most Optimistic Girl in the world prevents his suicide attempt, and later shows up again in the class he teaches at an unconventional high school. Itoshiki isn’t very good at committing suicide and the innocuous errands of a teacher’s life will inspire him to indulge in soliloquies that express his crushing despair. His students include a stalker girl, a shut-in, and a suspected victim of domestic violence. Kumeta has a simple and elegant art style that contrasts with the truly bizarre situations the suicidal teacher and his band of misfit students find themselves in. I’m starting to read Megan Whalen Turner’s The King of Attolia . With the fourth book in the Queen’s Thief series just published, I need to finish the third to get all caught up. Turner has created an evocative world that resembles the ancient Mediterranean, but her focus on the geopolitics and relationships between the characters that rule her city-states sets this series apart from the typical YA fantasy series. It has the feeling of great historical fiction even though the setting is imaginary.